As Chinese wages continue to rise and the economy transitions towards a more efficiency based structure of production, the Association of South East Asian Nations (ASEAN) has increasingly been tapped as the next factory of the world. Those looking to explore opportunities in ASEAN’s growing manufacturing base must be aware of the nuances found within the region and tailor their operations accordingly. In conjunction with wages differentials, the ability to leverage ASEAN’s young and educated workforce is largely dependent upon regulations found within respective member states. With direct cost implications for labor intensive investment projects, overtime limitations are among the most important considerations for potential investors. Although regulatory convergence is certain to be among the long term goals for the ASEAN Economic Community, there are still large differences between individual members states when it comes to labor regulation. 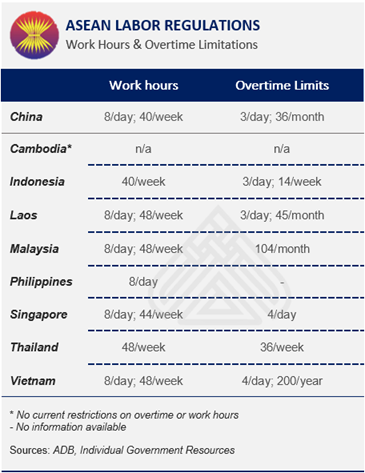 The following briefing overviews pertinent laws and regulations regarding overtime restrictions within ASEAN. Labor laws in Malaysia are laid out under the Employment act of 1955 and have been updated as of 2012. Under this legislation, working hours as well as overtime conditions are established. Article 60A(1) of the Employment Act stipulates the maximum number of hours that a person may be compelled to work, and thus presents the point at which overtime is to be applied. Under this article an 8 hour day – Art.60A(1)(b) – along with a 48 hour workweek – Art.60A(1)(d) are established. It is also important to note that 60A(1)(c) mandates that the number of working hours must be completed within a ten hour period. Any work beyond the ten hour mark is to be considered for overtime regardless of the total hours worked in the day. Art.60A(3) and 60D(3) of the employment act cover compensation for overtime work in Malaysia. When exceeding the aforementioned limitations on working days and work weeks, 60A(3)(a) requires that employees be compensated at a rate of 1.5x their normal wage. If, however, overtime occurs on a public holiday, compensation at a rate of 3x the normal wage is required. Under Art.60A(4)(a) of the Employment Act, limitations on overtime are to be decided via independent regulation. To date, existing limitations to overtime are codified in the “Employment (limitations on overtime work) Regulations” laid out in 1980. Regulation 2 of this package places a monthly ceiling of 104 hours on the quantity of time a person may be compelled to work in excess of their normal working hours. Implemented in 2003, Indonesia’s Manpower Act covers labor laws within the archipelago and thus sets forth relevant restrictions on overtime. Under the Manpower Act, Article 77 defines two ways for employers to schedule workers within a “normal” workweek. The first option – outlined in Art.77(2)(a) – restricts employees to a seven hour workday and forty hour workweek over the course of six days. Alternatively, Art.77(2)(b) – while maintaining a 40 hour workweek – allows for an 8 hour day so long as the workweek is restricted to 5 days. While Art.77 obliges employers to compensate their employees for overtime hours, Art.78(4) defers the specifics of payment to the Ministry of Manpower and Transmigration. Passed in 2004, ministerial decree NO.102/MEN/VI/2004 is the most recent legislation addressing such compensation. Art.11 of the aforementioned decree mandates that employers must compensate their workers at a rate of 1.5x their normal wage during the first hour of daily overtime work and 2x for every hour after. Any work that is completed on holidays is subject to regulation under Art.11(b). For employees working on a five day workweek, Art.11(b)(3) stipulates that they should be compensated at a rate of 2x their normal wage for the first 8 hours, 3x for the 9th hour of work, and 4x for any work afterwards. Alternatively, workers on a six day work week are subject to compensation under Art.11(b)(1) which requires pay at 2x the normal wage for the first 7 hours, 3x for the 8th hour of work, and 4x for any work there on out. Limitations to overtime hours are codified in the Manpower Act under Article 78. Art.78(1)(b) restricts overtime to 3 hours in one day and 14 hours in a given week. Together with normal working hours this would total to 54 total working hours in a given week. Labor regulation in Thailand is codified in The Labor Protection Act of 1998 and includes relevant restrictions on overtime. Article 23 of the Act restricts normal working hours to 8 per day and 40 per week. Any work beyond these limits is defined by Art.5 as overtime. Overtime may also be triggered under Art.64 in the event that adequate rest periods – specified in Art.28, 29, and 30 – are not provided. It is important to note that, pursuant to Art.24, workers may not be contractually compelled to work overtime and must be consulted on a case by case basis. In the event that overtime has been agreed upon, Art.61 stipulates that workers must be compensated at a rate no less than 1.5x the normal working wage. Overtime hours carried out on holidays are subject to regulation under Art.63 which requires compensation at rate of 3x the normal working wage. Under the Labor Protection Act decisions regarding overtime restriction are deferred to ministerial legislation. Currently, Ministerial Regulation No.3 – issued under the Labor Protection Act – sets a weekly limit of 36 hours for overtime within Thailand. While the majority of overtime is covered under this ministerial regulation, Article 11 of the Labor protection act sets specific protections for pregnant employees. Under this Article, such employees are prohibited from working between 10pm and 6am, working overtime hours, or working on holidays. In 2014, Extra-ASEAN Foreign Direct Investment Inflows reached an all-time high of 136 billion USD, and help to highlighting the region’s growing potential in the face of a shifting Chinese economy. However, with a diverse range of regulatory policies concerning working hours and overtime, effective utilization of the ASEAN production base mandates strategic decision making on the front end of investment. To find out more about overtime restrictions and their impact on regional wage differentials, please contact the HR specialists at Dezan Shira & Associates.